Eminent Tractarians explores contemporary issues of religion and morality, capitalism and social conscience, through a close examination of the lives of four people who followed the doctrines of the Oxford Revival: William Gibbs, a merchant in the early 1800s; William Butterfield, a church architect practising during the Gothic Revival of the 1840s; Thomas Heywood, a nineteenth-century banker who supported poor and working people through his patronage; and finally the theatre entrepreneur Lilian Baylis, whose eccentric life bridged the nineteenth and early twentieth centuries. 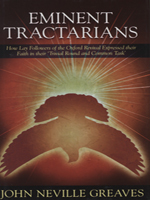 Tractarians was the name given to the leaders of the Oxford Revival because of their issuing a series of ‘Tracts for the Times’ between 1833 and 1841. John Greaves traces the history of the Movement, which was launched initially in 1833 to establish the Church of England as an institution founded by Jesus himself, as distinct from all human forms of government. It distinguished itself eventually as a strengthening of the High Church nature of Anglicanism, with a strong emphasis on social responsibility, and as a successor to the Evangelical and Methodist revivals of the late eighteenth and early nineteenth centuries. The overarching theme of honourableness in business and personal life is as relevant now as it ever was.